A few days back after trimming my front evergreen bushes I sauntered out to my back yard behind the shed where I keep my large brown plastic all-purpose trash bin. Outside of spring and fall, I rarely use it, but since the shrubs were getting a bit ragged looking, I knew it was time to cut and rake. When I leaned down to pick it up, I was startled by a little waif starling flopping around on the bottom. Poor thing must’ve fallen from its mama’s nest in the tree above. But I don’t think it had tumbled in just the past day or two, for the floor of the can was spattered nearly white with droppings. My guess is the mother had been swooping in to try and feed the little one in hopes to get it strong enough to eventually flap wildly and perhaps gain the altitude to scale the slick three-foot circular wall. Seeing its predicament I gently turned the preformed prison on the side and then slightly angled it so the tyke would slide down into the compost heap of old leaves and grass clippings I keep back there. When I pulled the tub away I looked down at this helpless creature staring up at me and cheeping with its head slightly cocked. I don’t think it knew to be scared. I had a rake so I flipped it around and ever so lightly nudged the fella with the handle trying to see if it might extend its wings. It tried, but obviously, they hadn’t been developed much yet despite its growing adolescent size. Above me a starling began to chirp, and I realized it must be mom. So I stepped back quietly and went around front to finish my work. When I returned ten minutes later the parent had coaxed the little one out into the back driveway. I sat down on the step of my shed to watch what might transpire. By and by the youngster flitted furiously enough to work its way up a chain link fence, where the mother waited. It made several attempts to fly, with mixed results. However, as time drifted along, it eventually figured out how to escalate a few times and glide enough to make it to a low hanging branch. I figured other lessons would continue over the week, and in the not-too-distant future the shiny black bird might be able to set out on its own. In subsequent days I went out to check and never saw it, so my hopes were high that it had succeeded. A few weeks ago I was blessed to meet April, a sophomore at Silliman University in Dumaguete City on one of the central islands of the Philippines. She is part of Compassion International’s Leadership Development Program (LDP) that identifies and provides a college scholarship to deserving students who have grown up in our sponsorship program. Like close to 1.5 million others like her around the world that Compassion is involved with, April comes from “the poorest of the poor.” Over 80% of the Philippines’ 91 million people live below the poverty line, and the majority of those, including April, survive on less than $2 per day. Despite being raised in a two room scrap-metal shack in an oppressive slum, she became the first in her family to graduate from high school (with honors no less), and now is among the elite at Silliman (a school of 7,000) where she is recognized as one of the leaders and top students. April may have been born into poverty, but poverty wasn’t born into her. Like most Filipino women, April is demur and tiny of stature, with piercing black eyes and even darker, silky long hair. But she is also fierce, feisty…and incredibly grateful. I couldn’t help but think of that little starling in my back yard. I will be praying that even as April was helped, she will in turn lead many others into a better place. She said, “Pick one you like, I need something to eat"
It was 1972 and there was nothing but wide-open road in front of us. It was on this trail that I first met Mike Johnson. We were at a rather primitive Christian rock festival held in a high school gym. Mike was one of the headliners, along with Larry Norman and myself. I was excited about meeting Larry, but even more so about meeting Mike who, in my mind, was THE true father of what we now call Contemporary Christian Music. It was because of his young visionary work with The Exkursions, a missionary band who worked with the Billy Graham Association and at the same time performed on street corners that had captured my imagination. My first impression upon seeing him onstage was, "HEY, he's doing my act!!" But our dreams were the same and we immediately got along. I casually invited him to visit me and my new wife, Barb, in Nashville. The next thing I knew he and his whole family were living in their camper in my back yard. My wife swears he beat us home. From that point on he was a part of my life all these many years. I, along with Wes Yoder and Bill Grine, had a Christian talent agency called Dharma Productions. 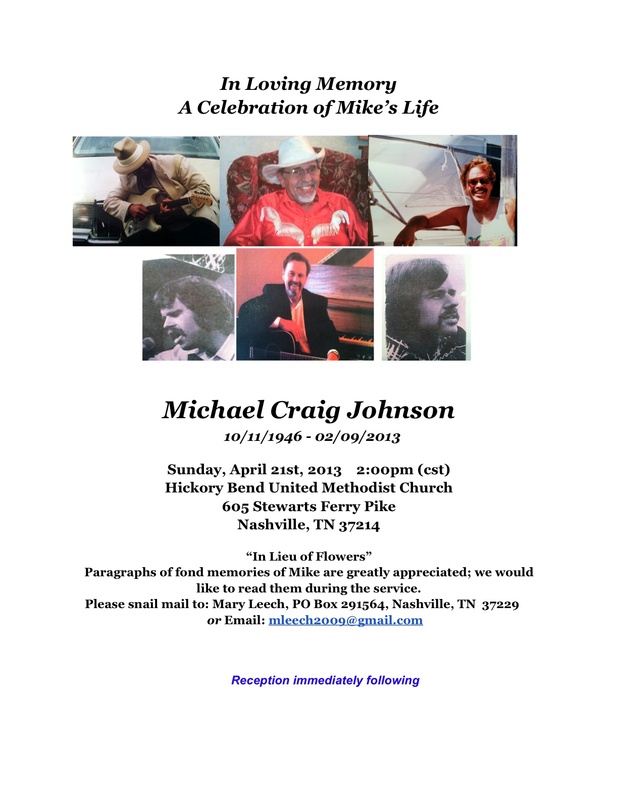 We started booking dates for Mike, and he and I also did road shows together. We started writing special songs as a duo. We then brought in Danny Taylor and recorded Matthews, Taylor and Johnson. The three of us toured for some time then Mike signed with New Pax Records and we all went back to doing solo gigs. Mike was also a great record producer. He helped countless artists with their projects and as long as I knew him he never stopped recording custom albums of his own work. I know this for sure because I have one whole corner in my garage stacked full of everything from two inch master tapes to 8 tracks to cassettes to CD's all titled "Mike Johnson." We were friends; we were rivals. We loved each other; we fought each other. We struggled endlessly to make Christians accept rock music and for non Christians to accept Christ. We were at the top together, we were at the bottom together. Our separate roads home intertwined in so many ways. Of all of Mike's accomplishments I am certain it was his work with Compassion International that he would be most proud of. He pioneered a new way for a Christian artist to communicate the plight of third world children...a way that has seen great success over the years, saving thousands and thousands of children's lives and touching the hearts of artists who, to this day, continue to communicate the heart of Compassion in concerts around the globe. I'm fortunate in that all my life I have been surrounded by people who were far more talented than myself. Mike was truly one of the most talented and inspirational of them all. I don't know if he realized just how deeply he touched so many. I’m not sure how many songs he wrote…hundreds that I know of…but I do know he was the most prolific writer I've ever known. And it was my great opportunity and experience to co-write with him for almost forty years. He would always make me laugh by telling me the latest joke he just heard and, like his songs, he had tons of hilarious tales. He was, without a doubt, the funniest guy I ever met. We were the best of friends. 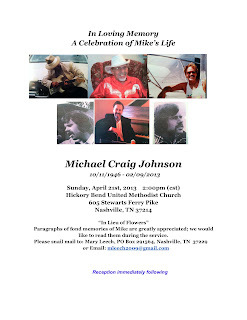 So, when I think of Mike Johnson I hear music and laughter and remember a spirit that never, ever gave up. He was a true Christian man and we'll never replace him. Nor would we try. Thank you for everything Mike! I was fortunate to have Brennan Manning a friend over the past 25 years. With his passing a few days ago at age 78, I've been searching for the right words to help deal with this loss. I went looking in my library for all my favorite books by him, and realized that I have loaned nearly all of them out to others, who, like me, needed to read “good news for the bedraggled, beat-up, and burnt-out;” fresh cups of grace to many who were tired of fellow Christians’ legalism and judgment. This piece written by Philip Yancey several years ago at the release of Brennan's final book, sums up well my thoughts on this humble, broken, and forgiven man who was much more interested in being a pioneer than a settler. Brennan Manning has written a memoir titled All Is Grace that will be published this year by David C. Cook Publishing. I wrote the Foreword, and include excerpts here about my friend. I first met Brennan Manning at an event called Greenbelt Festival in England, a sort of Christian Woodstock of artists, musicians and speakers that had attracted twenty thousand fans to tents and impromptu venues set up in the muddy infield of a horse-racing track. Brennan seemed dazzled by the spectacle, and like a color commentator kept trying to explain the subtleties of evangelicalism to his wife Roslyn, a cradle Catholic who lacked Brennan’s experience with the subculture. We did not see each other often over the years, but each time our paths crossed we went deeper, rather than tilling the same ground of friendship. When he visited a monastery in Colorado for spiritual retreats, he would sometimes get a temporary dispensation from the rule of silence and meet my wife and me at an ice cream parlor (one addiction he doesn’t disclose in these pages). Our backgrounds could hardly have been more different— Southern fundamentalism vs. Northeastern Catholic—and yet by different routes we had both stumbled upon an Artesian well of grace and have been gulping it ever since. One glorious fall afternoon we hiked on a carpet of golden Aspen leaves along a mountain stream and I heard the details of Brennan’s life: his loveless childhood, his marathon search for God, his marriage and divorce, his lies and coverups, his continuing struggles with alcohol addiction. At one point Brennan likens himself to Samson, that flawed superman whom God somehow found a way to use right up to the day of his death. Reading such stories in the Old Testament, I’ve come up with a simple principle to explain how God can use the likes of such imperfect men and women: “God uses the talent pool available.” Again and again, Brennan made himself available. In the last few years, nearly blind, subject to illness and falls, at an age when he should have been enjoying retirement on a beach in Florida, he kept getting on airplanes and flying places to proclaim a Gospel he believed with all his heart but could not always live. “All is grace,” Brennan concludes, looking back on a rich but stained life. He has placed his trust in that foundational truth of the universe, which he has proclaimed faithfully and eloquently. As a writer, I live in daily awareness of how much easier it is to edit a book than edit a life. When I write about what I believe and how I should live, it sounds neat and orderly. When I try to live it out, all hell breaks loose. Reading Brennan’s memoir, I see something of the reverse pattern. By focusing on the flaws, he leaves out many of the triumphs. I keep wanting him to tell the stories that put him in a good light, and there are many. Choosing full disclosure over a narrative that might burnish his reputation, Brennan presents himself as the Apostle Paul once did, as a “clay jar,” a disposable container made of baked dirt. We must look to his other books for a full picture of the treasure that lay inside. Let your heart by merry. Some people think it is difficult to be a Christian and to laugh, but I think it’s the other way around. God writes a lot of comedy, it’s just that he has so many bad actors. Laughter, joy, play and frivolous nonsense are things very close to the core of the real Christian religion and the purpose of human life. It is an article of faith that God invented pleasure and that the forces of opposing pleasure are in fact opposed to God. I do not like seriousness. I think it is irreligious. Or, if you prefer the phrase, it is the fashion of all false religions. The man who takes everything seriously is the man who makes an idol of everything: he bows down to wood and stone until his limbs are rooted as the roots of the tree or his head as fallen as the stone sunken by the roadside. Taking oneself too seriously causes us to forget the great commandment: You shall love the Lord your God with all your heart, with all your soul, and with all your mind. In enjoying God-given pleasures we are loving God; in letting other things destroy that enjoyment we are putting those things before God. It is not only possible to say a great deal in praise of play; it is really possible to say the highest things in praise of it. It might reasonably be maintained that the true object of all human life is play. Earth is a task garden; heaven is a play-ground. To be at last in such secure innocence that one can juggle the universe and the stars, to be so good that one can treat everything as a joke—that may be, perhaps, the real end and final holiday of human souls. When we are really holy we may regard the universe as a lark…that extreme degree of holiness which I have postulated as a necessary preliminary to such indulgence in the higher frivolity. Joy, which is the small publicity of the pagan, is the gigantic secret of the Christian. It should be a high compliment to a man’s spirituality and imagination to say he is a little giddy. In anything that does cover the whole of your life—in your philosophy and your religion—you must have mirth. If you do not have mirth you will certainly have madness. Laughter is the foundation of reconciliation. It’s one thing to say, ‘I don’t fear death’, but to laugh out loud somehow drives the idea home. It embodies our theology. Laughter is God’s hand on the shoulder of a troubled world. When you laugh, aside from the endorphin rush, there’s also a spiritual opening. You’re not so tight inside yourself. That opening I’ve found to be a real gift, in people being able to absorb spirituality. If you wish to glimpse inside a human soul and get to know the man, don’t bother analyzing his ways of being silent, of talking, of weeping, or seeing how much he is moved by noble ideas; you’ll get better results if you just watch him laugh. If he laughs well, he’s a good man…All I claim to know is that laughter is the most reliable gauge of human nature. When you laugh, you get a glimpse of God.